Flexible, expansive, and with a thoroughly modern sound, Icarus could give years of use to any contemporary dance producer. 1000+ presets. Excellent Wavetable Editor. Huge range of oscillator, filter & FX options. You might not love that enormous Tone2 sound. 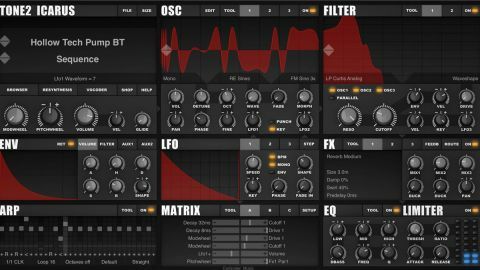 Tone2 describes its new plugin instrument (VST/AU) as a "3D wavetable synthesizer", by which it means it's a wavetable synth with the ability to morph said wavetables in various ways. Icarus' three stereo oscillators boast a jaw-dropping number of raw output options, housed in the Play Mode, Waveshape and Morph Mode menus directly below the waveform display. The 38 Play Modes start with your basic Mono oscillator and work through all sorts of (up to ten-part) detuned stacks, unisons, chords, flange effects and HyperSaws. The 50 included wavetables that can be loaded into each oscillator take in plenty of analogue-style entries (Saws, SawSquareSine, etc) alongside a ton of interesting electronic tones. With Icarus also able to convert external samples to wavetables (which we'll come back to in a moment), the Wavetable menu might only serve as a starting point anyway. The third oscillator menu, Morph Mode, applies one of 63 shaping processes to the wavetable playback, with the 'quality' of the morph set by the Morph knob. Morphs include filtering, frequency modulation, amplitude modulation, harmonic and chord stacking, pulse width modulation, phase distortion and hard sync. Morphs can be rendered into wavetables, too, enabling several of them to be applied in series (albeit with only the most recent one happening in real time). Back to that sample import function, then, which is actually resynthesis rather than simple playback of audio files. Although various caveats apply (use a clean sample, preferably mono and under two seconds long), and the results never sound exactly like the imported file, the ability to stretch, repitch and 'shuttle' the sound around feel quasi-magical, and experimenting with the Morph modes on your homemade wavetables proves very productive. As well as the basic and looped Resynthesis styles, there's also a Granulator option (with control over grain density, pitch, position and playback speed, the last freezing the sound at the current grain), and three Time Stretch modes: Small, Medium and Large, each trading off timing accuracy against artefacts. Next to the Resynthesis button, the Vocoder menu offers six preset vocoding setups for processing imported vocals, drums or anything else you like. The vocoder engine has 500 bands and sounds good, but we wouldn't call it a headline feature. A click of the Edit button reveals Icarus' Wavetable Editor, in which 50 included wavetables and those resynthesised from imported samples (single-cycle or longer) can be manipulated to an extraordinary extent. The top strip shows an overview of the wavetable and its constituent wave 'slices' (between 1 and 256 of them), with the selected wave displayed in the main editor panel below. A number of preset shapes are available for the whole wavetable and each of its slots, including several randomising options. The main display offers three edit modes: in Waveform mode, you draw the waveform directly using a palette of graphical tools; in Spectrum mode, the levels of the partials (harmonics) in the signal are adjusted; and in Phase mode, you're dealing with the 'phase spectrum', which can be toyed with to apply a range of timbral shifts. - enable numerous broad shaping operations to be performed. Modify, for example, offers bitcrushing, AM and FM, amongst other things, while Sweep is full of totally transformative edits. The Wavetable Editor works really well in general, but using sliders to set values for the menu modifiers (applied offline), never feels 'right' or intuitive. Icarus' two filters draw on a list of 62 types (from standard 'analogue' low-pass, high-pass and band-pass models to comb filters, vowels, fractals and a variety of EQ styles) and eight distortion modes (Saturate, Soft Clip, Waveshape, etc). They sound fantastic, whether used for gentle massaging or more overt sculpting. Assigned in the 18-slot modulation matrix, four shape-adjustable AHDSR envelopes (Volume, Filter and two Auxiliaries), three LFOs and a step sequencer can be brought to bear on the synth's oscillators, filters, effects and each other. The envelopes feature a menu of preset ramps, the main LFOs run up to 440Hz and include a huge array of waveshapes, and the Step LFO is effectively a looping multipoint envelope. There's a very powerful polyphonic arpeggiator onboard too, the output Velocity of which can be used as a modulation source. Finally, three effect inserts can each host one of 53 modules (reverbs, delays, dynamics, distortions, EQ, modulation-based processors, trancegate and more). The effects bank is configurable in three routings and incorporates Feedback and Ducking controls, the latter reducing the level of the effect tail when input is present. A three-band EQ and limiter mark the end of the signal flow. Icarus is one of the most versatile, impressive-sounding synths we've heard since... well, Xfer Records Serum, whose wavetable crown it clearly has its sights set on. The Wavetable Editor is particularly worthy of singling out for praise, as it makes the potentially daunting job of messing with waveforms supremely easy and rewarding. It doesn't hurt that the whole GUI looks great, either, with its beautiful animated waveform display - including a rolling 3D view of the wavetable as it's scanned - classy font and switchable colour scheme. An epic synth in every sense. Sonically and functionally, Icarus stands up well to Xfer's mighty rival, despite sounding very different to it. Icarus definitely has that characteristic larger-than-life Tone2 vibe - right from the raw oscillator level upwards, it's a shouter, designed to sound big, bold and glossy at all times, which may not be to every producer's taste. It would be unfair to call that a 'criticism', though, and ultimately there's no denying that Icarus is Tone2's finest achievement yet. Epic in every sense.